Following Nike's controversial endorsement deal with former NFL quarterback Colin Kaepernick, a private Missouri college is removing all uniforms bought from Nike that contain the brand's logo, reports the Associated Press. "If Nike is ashamed of America, we are ashamed of them" said College of the Ozarks President Jerry C. Davis, adding "We also believe that those who know what sacrifice is all about are more likely to be wearing a military uniform than an athletic uniform." Kaepernick, who began kneeling during the National Anthem in 2016, has become a divisive figure; representing a resistance icon to some, and an unpatriotic anti-American to others. 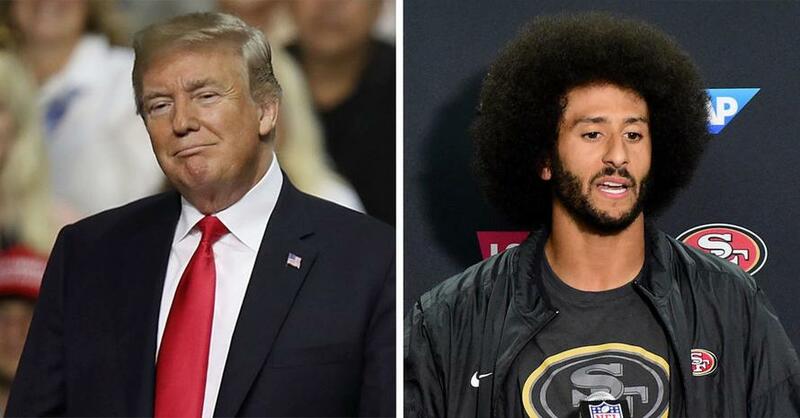 "I am not going to stand up to show pride in a flag for a country that oppresses black people and people of color," said the former QB - whose kneeling movement which began under the Obama administration has become a thorn in President Trump's side. In May, Trump told Fox & Friends "You have to stand proudly for the national anthem or you shouldn’t be playing, you shouldn’t be there. Maybe you shouldn’t be in the country"
And in a Wednesday tweet in response to the Nike deal, Trump wrote: "Nike is getting absolutely killed with anger and boycotts," adding "I wonder if they had any idea that it would be this way? As far as the NFL is concerned, I just find it hard to watch, and always will, until they stand for the FLAG!" Nike's ad featuring Kaepernick sparked outrage from the right, with several social media users posting videos of burning shoes and other Nike apparel. And on Wednesday we reported that legendary Green Beret sniper and ex-UFC star Tim Kennedy says he's boycotting Nike following their decision to spotlight former NFL quarterback Colin Kaepernick - as many in law enforcement and the military have taken offense to the ad's tag-line of "Believe in something. Even if it means sacrificing everything." Kennedy - who is currently participating in a military school course at Fort Bragg in North Carolina, told TMZ that Nike's ad is disrespectful to the US flag as well as to the men and women of the U.S. Armed Forces. Kennedy says that every member of the special forces in his team room had lost at least 10 friends who had "sacrificed everything." "You can’t go around that room [in Fort Bragg] and not ask a guy if he could list on his two hands friends that have died from Special Forces," said Kennedy, adding "I'm talking about REAL heroes and I'm surrounded by a bunch of them right now." "Since 2016, 381 cops have been killed in the line of duty. They believed in something and sacrificed everything as did the families they left behind. All of the men and women in law enforcement believe in something and are prepared to sacrifice everything."